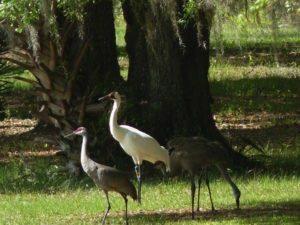 Florida sandhill cranes (Grus canadensis pratensis) are one of six sandhill crane sub-species found in North America. This non-migratory sub-species ranges from southeastern Georgia to the Florida Everglades and is listed as Threatened. The current population estimate for Florida sandhill cranes is around 4,600 individuals. In 2013 the FWC began conducting annual fall recruitment surveys through the core range of Florida sandhill cranes. FWC biologists established 12 routes, totaling 1,012 km, through private and public lands to keep a finger on the pulse of the Florida sandhill crane population. The number of chicks observed has varied with spring water levels; 2014 and 2015 were wet years and the number of juveniles observed was around 90 for each year, whereas 2013 was a drought year and only 38 chicks were noted. FWC will continue to monitor the population through the recruitment surveys. FWC is also trying to increase available habitat on public lands where only an estimated 500 birds or 15 percent of the population live. 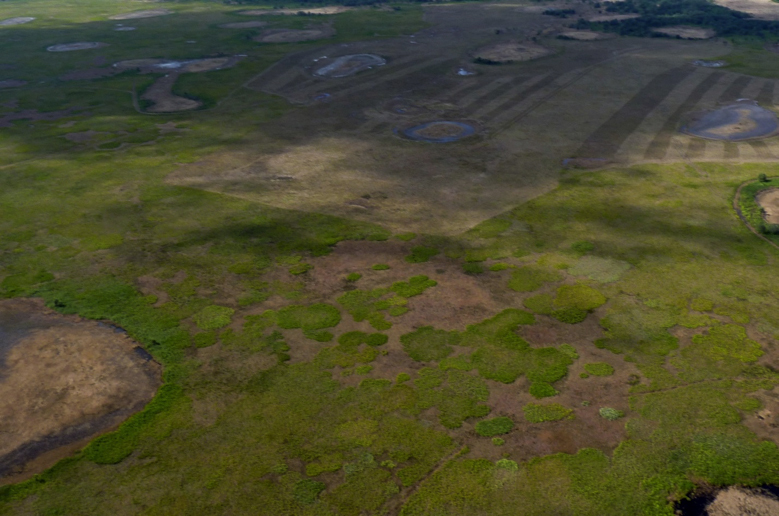 FWC began a habitat manipulation research project in 2013 with the goal to increase crane nesting on Three Lakes WMA. 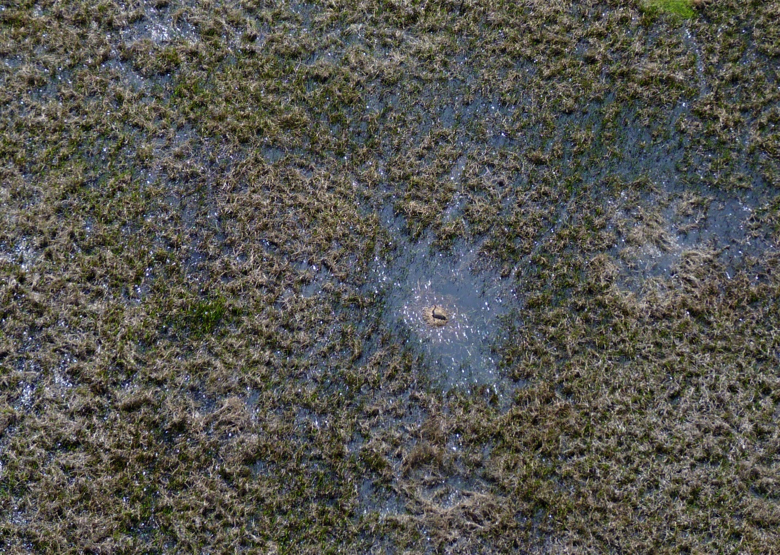 Like other crane species, Florida sandhill cranes require shallow, open wetlands for breeding, foraging and roosting, as well as open uplands with low vegetation for foraging. The Three Lakes site is rank with tall vegetation and saw palmetto, so we used half of the area as control and the other half was roller-chopped; both areas were later burned. We continue to monitor nesting through biweekly flights. The information from this habitat manipulation study will guide management recommendations. 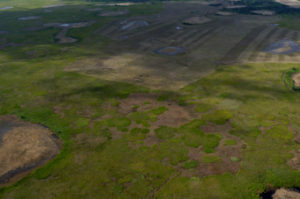 Biweekly flights throughout the Florida sandhill crane breeding season is the most efficient method to locate and monitor nests over the large Three Lakes study site. Half of the study site was roller-chopped and the other half left as control for the Three Lakes WMA habitat manipulation project. 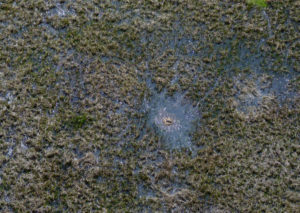 Palmetto surrounding marshes was especially targeted in treatment areas to reduce areas for predators to hide. The FWC also continues to help with whooping crane conservation. From 1993–2004, 289 whooping cranes were released in Florida in the hopes of establishing a non-migratory population. This attempt failed due to various problems, and the decision to stop all Florida releases was made in 2008. Currently there are 8-12 birds remaining in the population. Some of these individuals continue to breed and FWC is partnering with the USFWS and Louisiana Department of Wildlife and Fisheries to capture and relocate wild chicks of the Florida birds to a whooping crane reintroduction project in Louisiana―a task that has never been attempted. Whooping cranes stand about 20 cm taller than Florida Sandhill Cranes. This whooping crane hatched in 2015 and is a translocation candidate to join the growing Louisiana whooping crane population.